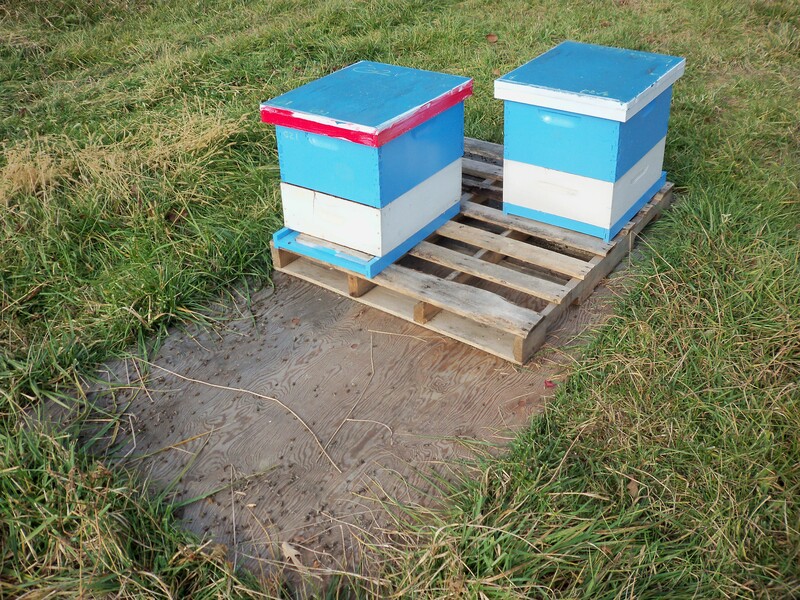 Winter is approaching and I just finished my first evaluation of honey bee colonies for potential breeder stock in 2014. I’ll evaluate these colonies again in spring, or at least the ones that survive the winter. The plan is to measure them in February and again in March so that I can make comparisons on ‘Spring buildup’, comparing their growth in Spring. I will also be able to evaluate them on their status in Fall, or change in Fall to Spring. Below are some graphs I’m experimenting with to visualize the data I collect. There will be 5 dimensions in the final graphs. Time: Change over time all measures (unavailable in the present graphs because spring is not here yet), the circles will eventually move to positions for repeated measures. Each colony is a circle. Their ID numbers are displayed. Hover over a circle to see the values. The ideal colonies would be colonies in the lower left corner, with the largest circles, and green in color. There are few perfect index scores (colors of circles) because I overfed these colonies and most were honey bound which reduced their score for brood pattern by 1 point. This is not a result of their genetic value, but instead a result of management. The graphs don’t show this, but if I made it so the ‘notes’ about each colony appeared when you hovered over the graph, then that would be more apparent. In the next graph, I have culled some of the colonies that had high varroa, low bee populations, high nosema spores, and bad index scores. In spring, I will cull more colonies, but for this graph, I just culled some to get a better view of the better colonies. Once I have additional measures on these colonies in Spring, I’ll make it where you can click on a button and the circles will move, change size and color based on the new measures. That way, the change in colonies over time can be viewed. These graphs are made with Google Charts. The idea of these graphs is to better visualize the measures on the colonies and better understand the performance of each colony. This will help me make an informed decision on which colonies to use as breeder stock in 2014. A cloak board is a very versatile tool for raising queen. This colony pictured here has been used off and on again as a queen cell builder and queen bank throughout the season. A cloak board is simply a queen excluder with a metal insert that can be inserted to divide the colony in two, or removed to unite the colony while confining the laying queen in the bottom box. It also creates an entrance for the top box. As a ‘cell builder’, I’ll graft about 30 queens once a week into the colony. As a queen bank, I let the queen cells emerge in cages and the nurse bees care for the new virgins till they are introduced into mating nucs within a few days. Here is a cell builder / queen bank using a cloak board. It is at the end of the season and now a new queen has been released in the top. The old queen is still laying in the bottom box, with the entrance open on the other side. 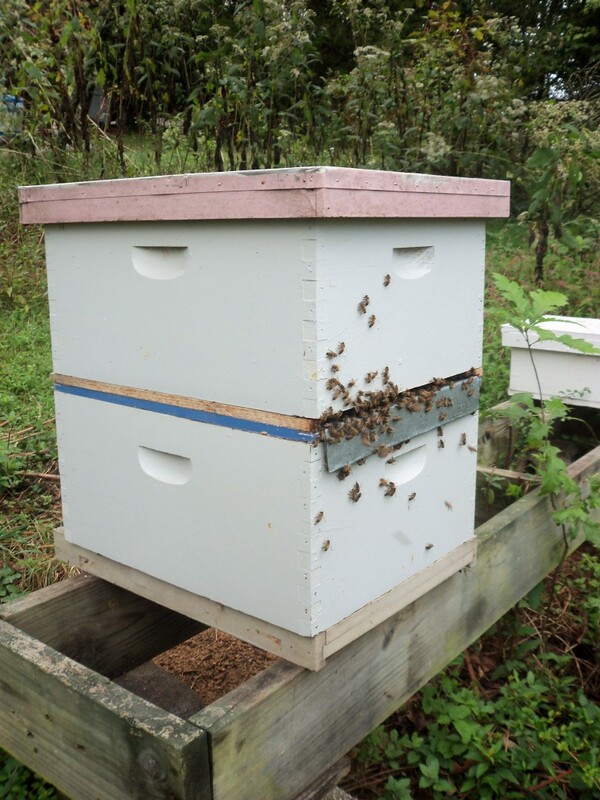 In late October, when the top box is queen right and progressing well, the colony will be divided. To setup a cloak board cell builder, I use the following procedure. Several days before grafting, setup a strong double deep colony from one or more colonies that has been previously treated for varroa mites. Reverse and close the entrance on the bottom board. Find, mark, and place the queen in the bottom box. Make sure you have empty combs for her to lay in the bottom box. Insert the cloak board in the open position with the entrance pointing in the direction that the lower entrance was formerly pointing in. The bees will orientate to the new, higher entrance. Feed the colony before and throughout the period of raising queens. Be sure and check for queen cells and destroy any. (i only do this in cell builders). The top box will need 1 frame of larvae and 1 frame of pollen in the top box along with honey and an empty comb or foundation for bees to store nectar. Capped brood can be included. Have the larvae and pollen frame towards the middle of the box as the grafts will be placed between these two frames. Having the larvae in this box will lure nurse bees up from the lower box into the position grafts will be placed. The bottom box will need capped brood, some honey and pollen, and empty comb for the queen to lay in. A frame of larvae can be included, but not more than 1 frame. Leaving only 2 frames of larvae in the entire colony will keep the larvae from out competing the grafts for the attention of the nurse bees. Check all frames for queen cells and destroy any found. Returning foragers will return to the top box, using the new entrance they where trained to earlier, crowding the top box with well feed bees. If there does not seem to be enough adult bees in the colony for this to work correctly, shake adult nurse bees from other colonies into the top box on this day with the board closed. The colony needs to be boiling with bees to raise good queens. Graft from a good colony placing the cells between the larvae and pollen frame. Some recommendations say to remove the larvae frame at this time, but my experience is that if grafting only about 30 queens, this step is not necessary in a good cell builder. If raising more queens per graft, you should remove the larvae frame. I remove the capped queen cells to an incubator. At 10 days after grafting, they will be caged and placed into a queen bank setup pretty much the same way this cell builder is, except the cloak board will be left closed as long as the virgin, caged queens are in it. Start again at ‘2 days before grafting’ to setup to graft again. At this time, also be sure and check each frame for queen cells and destroy them. Eventually, you will miss one and end up with a virgin in the colony and it will no longer be usable as a cell builder, or you will injure the queen disrupting the colony so much, however you should be able to use it several times ( a number of months) until that happens. Here are a couple of colonies that looked great going into winter, but died rapidly before spring with a small cluster of bees left and plenty of stored honey. Varroa mite infestation is suspected for their demise. You can see a number of dead bees on the plywood. This picture was taken in January. These colonies where untreated for mites or nosema as part of evaluating potential resistant breeding stock. Linked here is the hive InspectionSheet I use for evaluating colonies in my stock improvement program. Mites are recorded with a powdered sugar test while Nosema spore measures are recorded on a separate piece of paper. 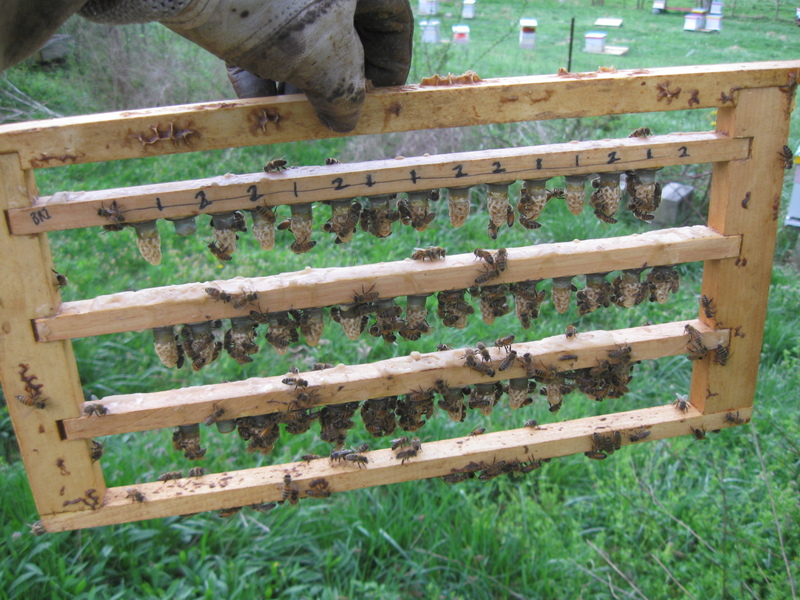 Doing these measures at specific times, allows for calculations of specific interests, such as the change in number of adult bees in spring, or change in mite population growth The numbers of frames of each measure (bees, brood, etc.) is done by generally estimating by looking at the frame. Sometimes, I will deviate from this inspection sheet by estimating only the number of adult bees, thereby avoiding pulling out every frame to look for brood and stores. This for example can allow for an early estimate of the over-wintered cluster when its still fairly cold. Beekeepers brand their boxes to discourage ‘bee rustlers’ and, well its just aesthetically pleasing. 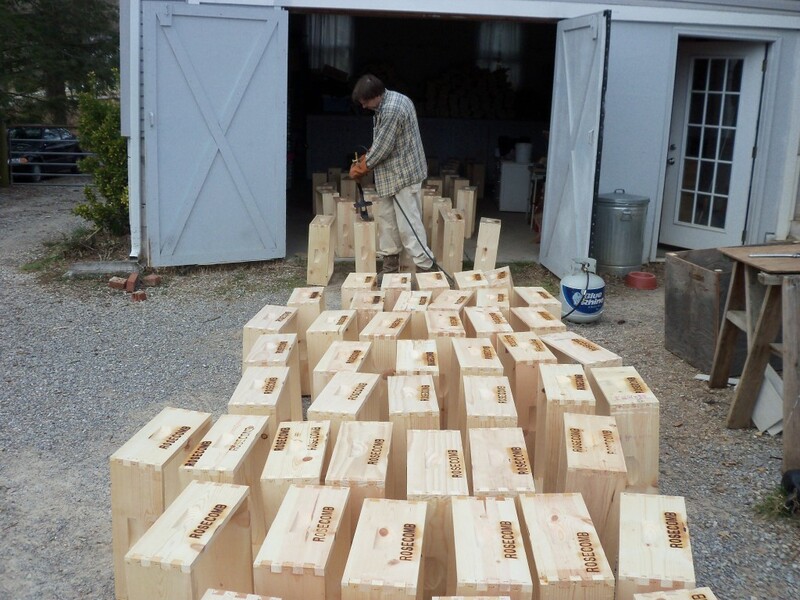 Here I am branding some new boxes for 2013. My brand is ‘ROSECOMB’ for Rosecomb Apiaries. Once you coral them in a small space like a garage, you can manage to hold them down for the brand as them come out. Once its over, they line up pretty good. Here is an excellent article published in the Journal of Apicultural Research 52 (1) 2013 which overviews good methods for queen rearing and breeding selection methods. Fall is close to ending at my home / queen yard. 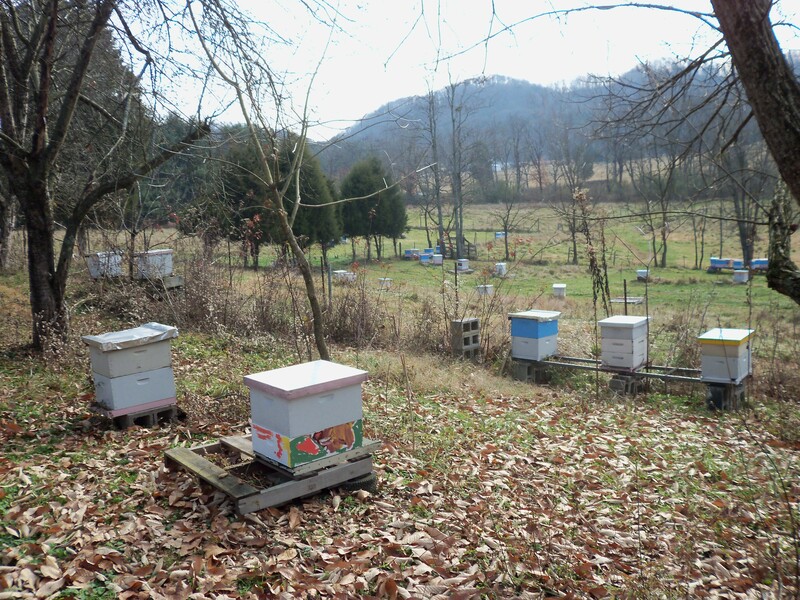 For the bee breeding project, I started about 60 new colonies for the season to evaluate as potential breeding stock for 2013. About 20 of those where selected against by natural causes, leaving just under 40 colonies (some of which are pictured below) to evaluate. I’ve completed two evaluations of colony strength, diseases, and pest levels. In spring, I’ll do a third and final evaluation. To prepare them for winter, since the end of July, I’ve feed each colony about 9 gallons of syrup and 1.5 pounds of pollen. This was required to start and keep this many colonies in one place for a comparable evaluation. Each colony was required to build the majority of their combs to give the opportunity to evaluate them for comb building and colony growth. With the warm weather we expect this weekend, I’ll probably try and give them one more feeding before winter. A warm fall and winter is not necessarily good for the bees in our area because they become active while few flowers are available. 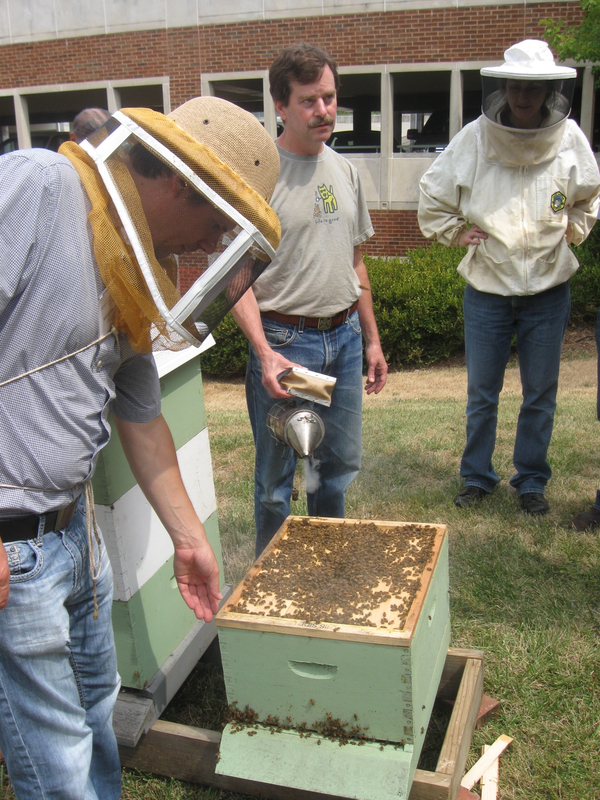 The 2012 Heartland Apiculture Society queen rearing short course in St. Louis was a success. 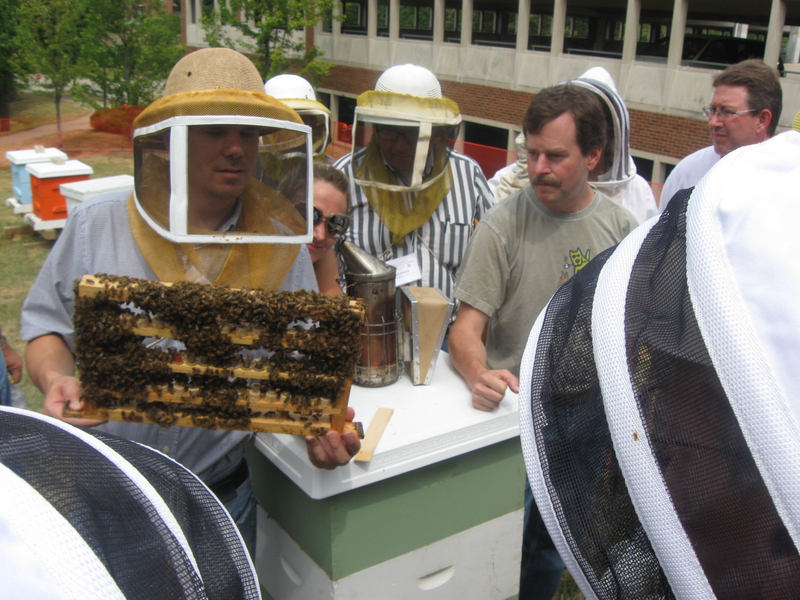 We provided presentations, a grafting workshop, and apiary demonstrations over three days. 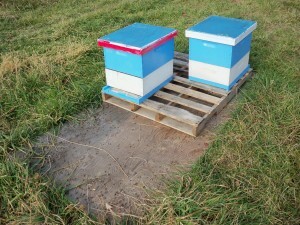 Here are a few pics of the cell builder we set up in the apiary, a ‘queenless cell starter / finisher’. A cell builder is a colony manipulated to raise queen cells from grafts. Here Greg Hunt and Krispn Given (Purdue University) are opening the cell builder to check our grafts. We set it up two days before by removing the queen, reducing the hive down to a single deep, leaving little brood, and shaking large amounts of nurse bees from other hives into the box. The next day we placed our grafts into the queenless and crowded hive, and here we are about to check them for acceptance the following day. Notice there are LOTS of bees in the hive. That’s what you need to get many cells started and finished. Here Krispn Given is holding the frame with the cell cups. Notice how many bees are covering the cell bar frame. Here again, many many bees are needed to start and finish the cells. This is a double thick frame holding 6 cell bars. This gave everyone in the class a chance to try grafting several cups and see if they would be started. Started cells are indicated by royal jelly in the cell and some construction of wax around the top of the cup. In unaccepted cells, the larvae are removed and less wax is build around the rim of the cups. Here is the cell builder with the cell bar (grafted cells) removed from the center. Notice again how the builder is packed with bees. There is a division board feeder on the right to provide the builder with copious feed to build the cells. They nearly emptied it in 24hrs. The frame beside where the cell bars was has a good amount of pollen so its nearby the queen cells being fed. When setting up the cell builder, any brood remaining in the colony (although very little is desired) should also be next to the cell bars to keep nurse bees near where the grafted cells are placed the following day. Once the cells are capped at day 5 after grafting they could be moved to an incubator, or left to incubate in the colony until day 10 when they are ready to be placed into mating nucs. This colony can be used again to start and finish more cells once the first set is capped. To keep the colony going, since its queenless, one or two frames of capped brood, with some open brood, can be introduced each week at the position beside the queen cells. More nurse bees (bees on brood frames) from other colonies can be shaken into the box if the population drops noticeably. This setup can be used for a month or even longer, as long as it is producing good cells. 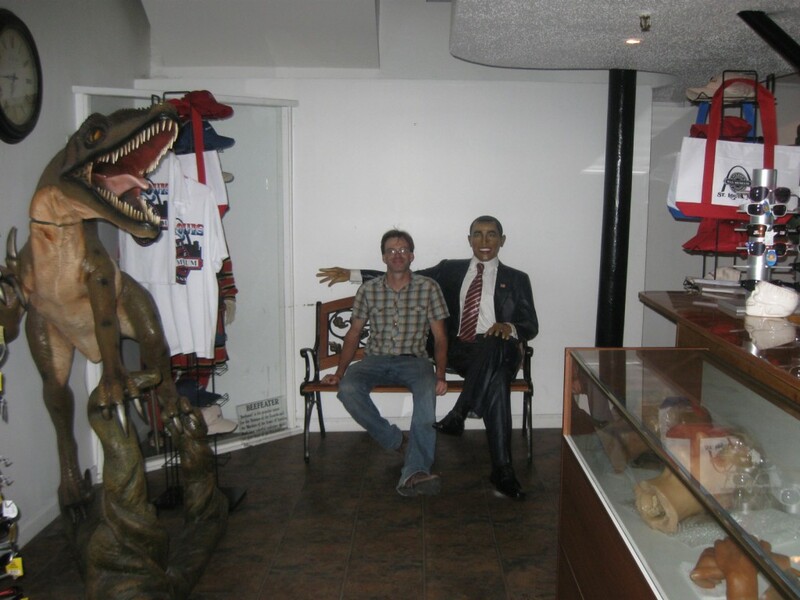 On a side note, here I am with President Obama whom happened to be at a downtown ice cream parlor. 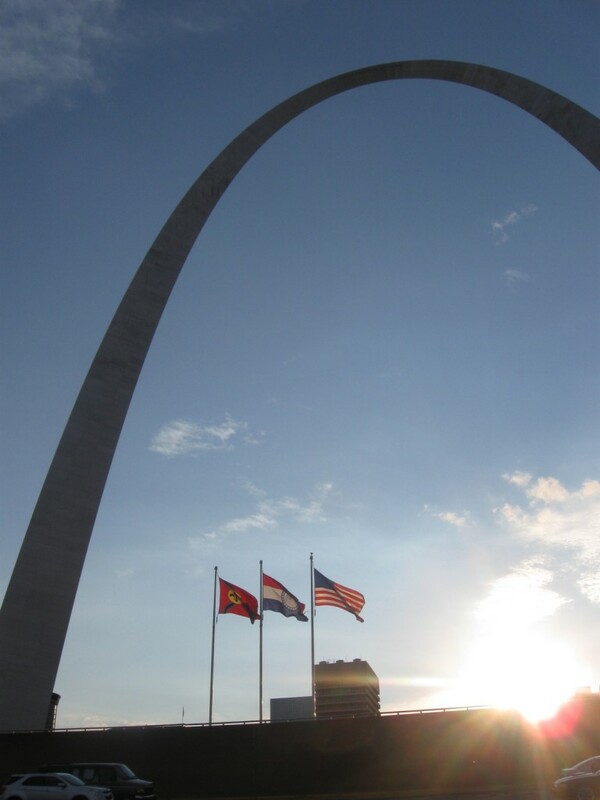 And you can’t go to St. Louis without checking out the arch. For the third year in a row, I’ll be helping out with the Heartland Apicultural Society (HAS) Conference and queen rearing course. This year we will be in St. Louis, MO, July 12 – 14th, University of Missouri. See full details of the conference, schedule, and registration info at www.heartlandbees.com. Greg Hunt and Krispn Given from the Purdue University Bee Lab will be doing the full planning of the short course this year. In years past, other’s to help out with the instruction have included Larry Connor (Wicwas Press), John Skinner (Univ. of TN), and Garrett Dodds (USDA-ARS). Come graft a bar of cells at HAS 2012! I highly recommend an introductory course (especially this one) as you learn how to raise queens. But be sure that no amount of coursework is a substitute for practice, practice, and some patience. 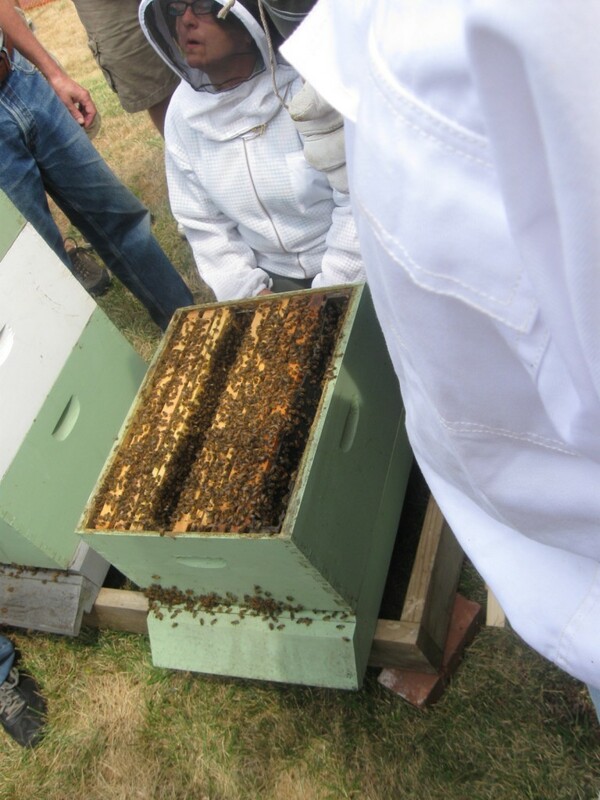 However, courses are great for both an overview and those little key pieces of information that make an enormous difference to your beekeeping operation. We demonstrate steps in raising queens, in the apiary, with the bees. There is nothing like the experience of actually doing a task (like shaking loads of bees into a swarm box) to add clarity to your understanding of how something works. Hope to see you there, or at an HAS in the future. 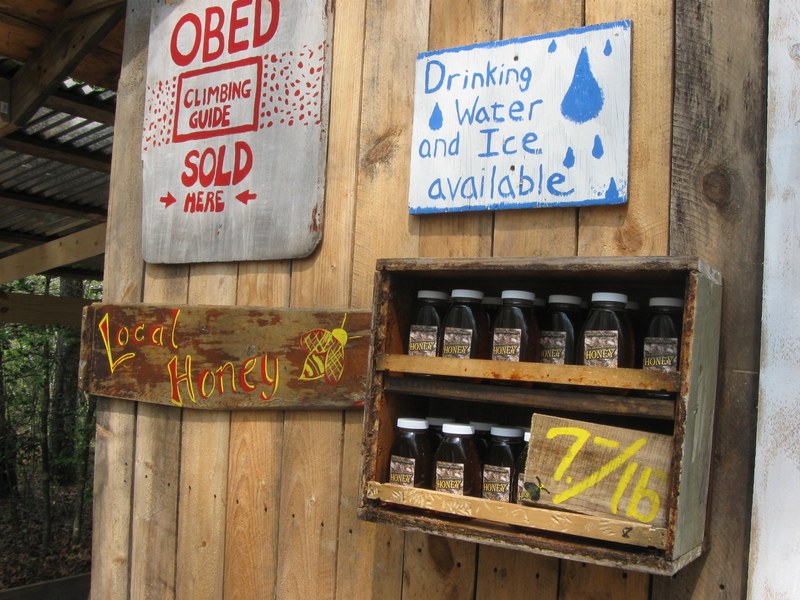 ..is the place to buy Rosecomb Apiaries honey when you are camping out at the Obed in Morgan County. Its at the Lilly Access for Clear Creek. If you don’t know where I mean, you don’t know where I mean. Other amenities include, the Obed Climbing Guidebook by Kelly Brown, ice, used books, bug spray, lighters, batteries, climbing chalk, and other necessities for the camping rock climber or whitewater boater. Primitive car camping is $5 per night per person. The Lilliy Pad General Store. 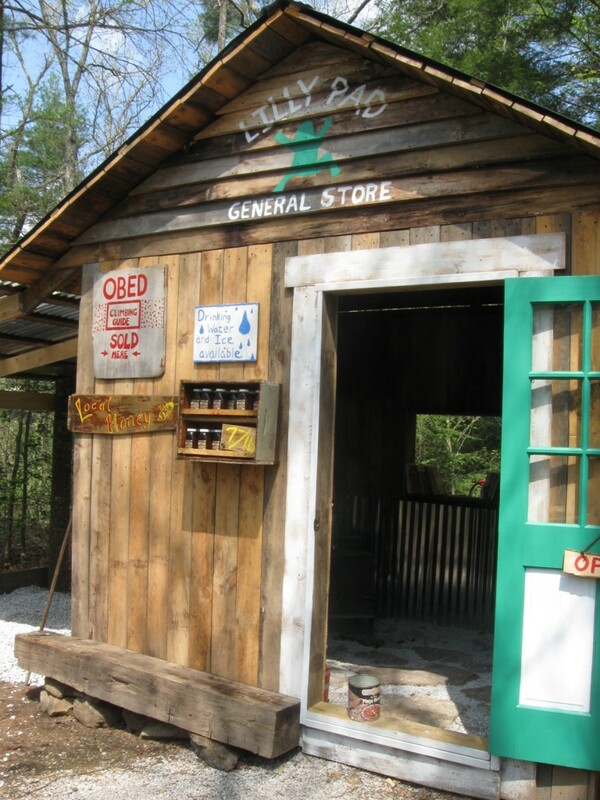 Get you climbing guide book, ice, honey, used books, and other camping gear for the Obed Wild and Scienic. I made the honey shelf out of an old bee hive super, a bottom board, two top bars from the frames, plus one board in the middle.